The ideal spot for iceberg watching is to relax on the rocks along the coastline in the town of Quirpon, Newfoundland. A massive iceberg comes into view just off the rocky point and the harbour of Quirpon is filled with enormous pieces of pack ice displaying their beautiful blue coloring. Woman iceberg watching from the shore in the town of Quirpon with pack ice in the harbour, Trails to the Vikings, Viking Trail, Great Northern Peninsula, Northern Peninsula, Newfoundland, Canada. Model Released. 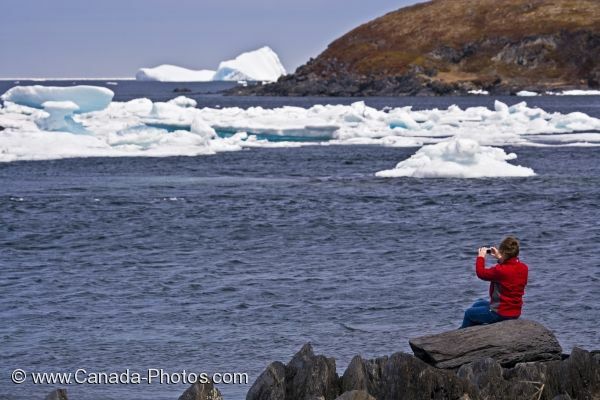 Picture of a woman iceberg watching from the rocky coastline in the town of Quirpon in Newfoundland, Canada.